Reports are this is only affecting personal @gmail.com accounts, and not Google Apps / business domains. This has the potential to affect open rates for Gmail by only tracking the first open, then caching the image on their own servers for subsequent opens. If they are caching images pre-open, there's also a potential for false positives for opens to result. Are you seeing this issue? Do your Gmail stats look wacky? Let us know what's going on, and we'll keep you updated with what we find as well. A comment on our blog post showed that at least one user is seeing issues with how Google is caching images - likely that they are compressing them and causing the images being served to readers to be very poor copies of the original. Has anyone else experienced something similar or have any inside knowledge into what is happening? Just ran another test and it all looks fine now. I've just found the same thing. I had a .gif using grey and white and gmail has decided to make the grey transparent making the image almost invisible. There was no transparency on the original image. On another .gif image it has changed a blue and white gif to almost all white. One thing to note, the gifs where I used transparency and the animated gif I used don't seem to have been affected. Top images is what I sent bottom is gmail making it transparent. I've just come across this exact issue with .gifs. I'm going to switch to .png and see where I'm at. Laura Atkins over at Word to the Wise just wrote up a pretty extensive blog post on the subject. When someone opens a mail, Google will check to see if that image is in their cache, if it isn’t, then they follow the link, load the image and put it in the cache. Any time someone tries to load that same image, whether the same or a different recipient, Google will serve the image from the cached page. The result is that senders can track the first open, but no subsequent opens. There are a number of services which provide geo-specific images depending on where the images are opened from. This new proxy is going to break that. Google just gave some of their reasoning behind the new image caching. Basically, they site security concerns. It's interesting to note that they will now be showing images by default in HTML emails. Here are a few more articles on the subject, I'm sure this will be a pretty big topic for email marketers and we'll learn more over the next week or so. Google Gmail Change Breaks Email Open Tracking by Tim Watson of Zettasphere. Gmail Breaks Email Marketing? by Andrew Bonar of Campaign Monitor. Movable Ink just posted an overview of the problem as well as how they are handling it. As one of the businesses that could greatly be impacted by this change, it's interesting to hear their take. Brian, I'm drafting a post on the subject that will be published soon explaining what's going on, how it affects marketers, and what it means for Litmus Email Analytics users - keep an eye on the blog! "Point 3 Gmail appears to provide the original user-agent within the request, however code changes are likely to be required at various EDM, Tracking and Reporting Platforms to ensure this issue can be worked around. However it is not out of the control of EDM platforms to resolve this issue without any further change or assistance from Gmail." Am I correct in taking that to mean this is a fixable issue that will just require updates from Litmus and/or ESPs? Regarding: "Gmail appears to provide the original user-agent within the request" - we're not seeing that, does anyone else see how or where exactly in the request that is happening? It looks as though there could be a fix for tracking problems related to Google's new image caching. Two articles point to a solution where the HTTP header for the tracking image can fix the problem. Some ESPs and services serve a header with a content-length greater than zero - which triggers caching. If you serve a content-length of zero for that image, Google won't cache the asset. We will be checking this out more and will update the thread accordingly. Yet another great look at what is really going on, in response to the Ars Technica article that took Hacker News by storm. This article from Filippo Valsorda goes through what Google is actually doing and dissects the Ars article a bit. We've seen a few reports of images completely failing to load through Google's caching servers. This includes someone who did extensive testing and found that images were failing to load only in Gmail's web interface. Has anyone else experienced this or tested out a similar problem? I've seen numerous tweets about this occurring and have even seen it a few times in my own Gmail account. From what they've seen, it's a Gmail issue that's affecting all senders (regardless of what ESP they are using) and only occurring in the Gmail web interface. While some are reporting that some or all of a campaign's images aren't loading, there has also been reports of images loading in the wrong placeholder—definitely not ideal! As of yet, a solution hasn't been found to combat this issue. 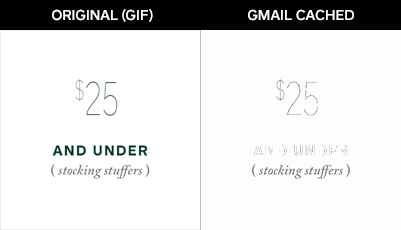 As a result, now more than ever, it's important to design your emails for images-off optimization—use ALT text, background colors, and lots of live text to make sure your emails are still legible and actionable regardless of whether images are present or not. I had an email I received from Bing Rewards in Gmail have this issue (here's the Scope: https://litmus.com/scope/lm4suqiozus6) None of the images loaded in the Gmail client for some reason (very glad they had a "view this in your browser" version for backup!) Not sure if something in the URLs or HTML/CSS caused that to happen or what. Also, I noticed when I updated the Gmail app for Android 4.4 this weekend that images on is now by default. "Show images" no longer appears in the Gmail app. (https://play.google.com/store/apps/details?id=com.google.android.gm - under "What's New"). Has anyone seen this updated in iPhone/iPad? We just published our overview of what is happening and how effects email marketers and EA users specifically. I totally get dynamic content served via location as a concern. I'm wondering about other types of dynamic content, though. If an email displays a specified image via a datafield (for example, if gender equals female, then server this picture, if gender equals male, then serve that picture), is this process at all impacted by Gmail caching?